ASHP Market size was valued over USD 30 billion in 2017 with annual installations to surpass 13 million units by 2024. Favorable regulatory framework along with clean cooling & heating programs to encourage the adoption of conventional Heating, Ventilation, and Air Conditioning (HVAC) unit, will positively impact the air source heat pump market share. In 2017, the NYSERDA introduced an “Air Source Heat Pump Program” with an aim to help the New York state to deploy renewable energy, reduce reliance on fossil fuels, integrate energy efficiency and save money. Ongoing adoption and deployment of sustainable systems to mitigate the adverse environmental impact will further stimulate the product penetration. Rising demand for energy efficient systems to reduce electricity bills coupled with green building standards and codes will embellish the overall air source heat pump market size. In 2017, the regulators across the U.S. introduced a tax rebate for commercial and residential sectors to support the adoption of energy efficient technologies by 2021. Rising industrialization and urbanization along with increasing disposable income across emerging economies will further complement the industry landscape. As per the World Bank analysis in 2015, more than half of the Asia Pacific population resided in urban areas, exceeding the total population of the U.S. and Europe. 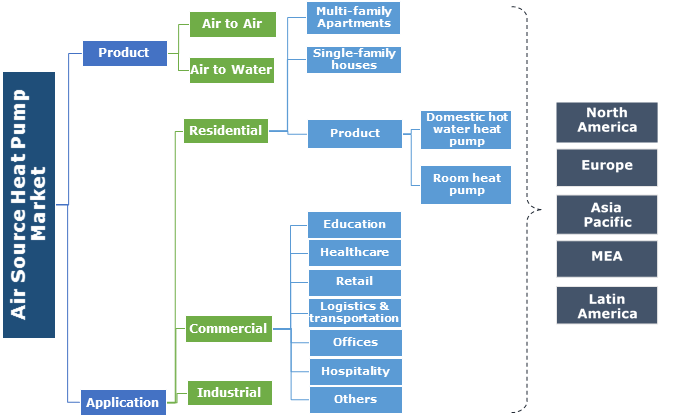 Air to air heat pump market is set to expand over 5% on account of its suitability across a wide range of properties and its ability to purify air. ATA units can either be used as an effective way of complementing the existing conventional heating and cooling system or as a stand-alone system, making its adoption suitable. Generally, these systems are preferred over ground source heat pump units owing to zero expenses for ground works and cost effectiveness. Ability to provide water heating solutions as well as space heating & cooling will propel the Air to Water (ATW) heat pump market growth. Ongoing technological advancement to meet the growing product demand across residential establishments will further propel the global air source heat pump market size. In 2017, Stiebel Eltron developed an indoor air/water series for cooling and heating with power control: WPL which is an ideal indoor pump to ensure low acoustic emission. Residential air source heat pump market is predicted to grow owing to the rising awareness toward reduction of energy bills coupled with shifting trends to improve living standards. Increasing adoption of innovative technologies on account of increasing disposable income of individuals will fuel the product penetration. In addition, rising demand for high-level comfort along with efforts to improve air quality will further drive the business growth. Commercial installations in 2016 accounted for over 11% of the global air source heat pump market share. Replacement and retrofit of existing heating and cooling units coupled with growing investments toward infrastructural development will favor the business outlook. Rising demand for flexible HVAC systems, which can integrate easily with the conventional system across existing and new constructed buildings will further embellish the industry growth. The U.S. ASHP market is predicted to witness strong growth owing to rising concerns to control carbon footprint coupled with introduction of government initiatives to encourage the adoption of heat pump units. 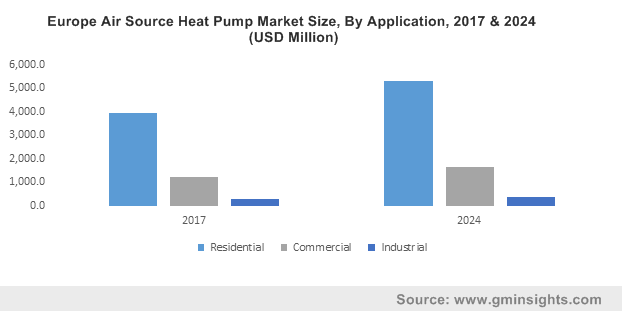 Growing demand for water and space heating across commercial and residential establishments in the nation will further fuel the air source heat pump market growth. According to the U.S. DOE in 2016, water heating across residential buildings accounted for around 18% of their overall electricity consumption, with commercial buildings accounting for over 4%. Germany ASHP market is set to surpass 65 thousand units by 2024. Increasing prices for electricity coupled with climate change impacts will complement the air source heat pump market. In 2016, electricity prices in the nation reached USD 34.61 kWh when compared to USD 27.58 kWh in 2010. Renewable Energies Heat Act across the nation encourages all new residential and commercial buildings to adopt sustainable heating scheme. All the new building construction in the country, on or after January 2016, have been directed to abide by renewable integration reforms. Eminent industry players across the ASHP market include Bosch Thermotechnology, A.O. Smith, Carrier, Mitsubishi Electric, Daikin Industries, NIBE, Fujitsu General, Johnson Controls, Danfoss, BDR Thermea Group, Dimplex, Husky Heat Pumps, LG Electronics, Panasonic, Climaveneta, Colmac, and Vaillant. The leading industry participants have extensively adhered toward mergers & acquisition to justify and augment their position in the air source heat pump market. In 2017, NIBE acquired 50% stakes in the Canada based, CGC Group of Companies with an aim to have an additional platform for heat pumps for the commercial applications in the U.S. and Canada. An ASHP is a renewable heating and cooling system that transfers heat from outside of building to inside or vice versa. These units can provide efficient cooling and heating for commercial, industrial, residential buildings. The systems are a low-carbon alternative to conventional oil boilers or solid fuel heating system. In ideal conditions, it can offer up to three times additional heat when compared with electrical energy it utilizes.